The time value of money is a very important concept for each individual and also for making important business decisions. Companies will consider the time value of money while deciding about whether to acquire new business equipment or to invest in the new product development or facilities, and for establishing the credit terms for the selling their services or products. There are two aspects of the time value of money the first one is the future value of money and the second one is the present value of money. Future value of money would be what would be the worth of money in future which is invested today, and the opposite is the present value of money which says what will be the present value of the amount that will be received or paid in the future. 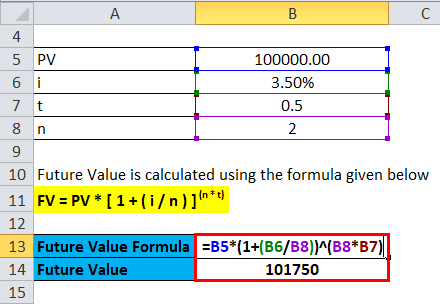 Let’s take an example to understand the calculation of Time Value of Money formula in a better manner. Let us Assume that a sum of money say $100,000 is invested for two years at 8% interest. What will be the future value of the sum invested? 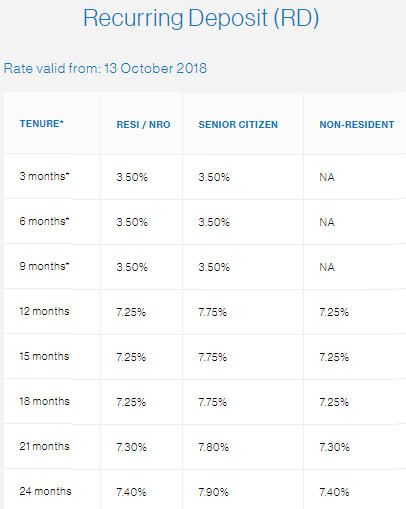 Below is the extract from standard chartered bank deposit rate (recurring deposit) available for various periods. Now let’s assume that you decide to invest $100,000 say for period 6 months, then what is the value you would expect to receive? Here, PV is $100,000, Rate of interest for 6 months applicable is 3.50% p.a., number of years is 0.5 (1/2) and the number of compounding per period will be 2. 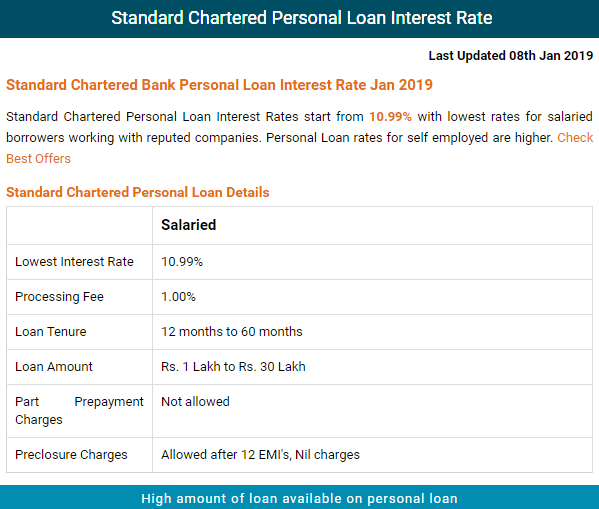 Below is again extract of loan details from a standard chartered bank where bank will lend say 100,000 to its client at a rate of interest 10.99% and say the term is 2 years.. 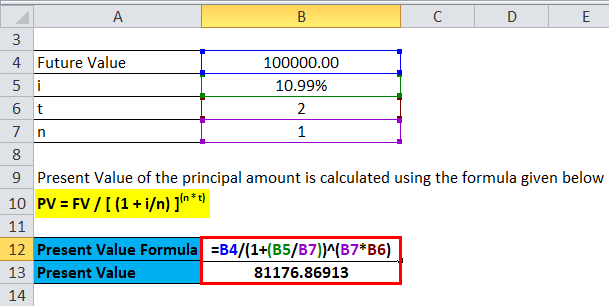 In this case, the bank will calculate the present value of the principal only that is the present value of the money which the bank would receive in the future. 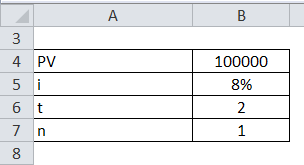 Here the FV is 100,000, i is 10.99%, t is 2 years and n is 1 year. The Time Value of Money concept will indicate that the money which is earned today it will be more valuable than its fair value or its intrinsic value in the future. This will be due to its earning capacity which will be potential of the given amount. Time Value of Money (i.e. 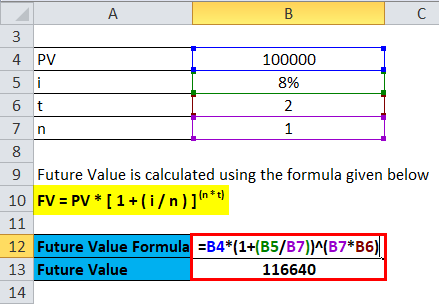 TVM) can also be referred to as Discounted present value. Money which is deposited in the savings bank account will earn a certain interest rate as it must compensate for keeping the amount of money which is invested by a client and is away from them at the current period. Therefore, if any bank holder will deposit $200 in the bank account, then the expectation from the customer will be to receive more than $200 after 1 year. The time value of money is a wider concept and can also be related to the concepts of purchasing power and inflation. Both the factors will need to be taken into account along with whatever the rate of return that may be realized by investing the amount of money. Why is this factor being so much important? Well, the reason being inflation constantly erodes the value of the money, and henceforth the purchasing power of the money. This can be best exemplified by the value or the prices of commodities such as food or gas. Let’s say for example if you were given a certificate for $150 of free gasoline in 1991, then you could have purchased a lot more gallons of gasoline than you could have in hand if you were given $150 of free gas a decade i.e. say 10 years later. You can use the following Time Value of Money Calculator.